Lakeland Village is a private waterfront home community that extends over 19 wooded acres and borders 1000 feet of sandy beach! All 260 town homes and condominiums are privately owned. Lakeland Village homeowners enjoy amenities such as a pier/ dock, Sandy Beach,3 swimming pools, two hot tubs, 2 saunas, fitness center, parking garage, 2 tennis courts, BBQ’s, pool furniture and so much more! Lakeland Village is centrally located in South Lake Tahoe with beach, street and bike trail access to shopping, restaurants, entertainment, casinos, golf, ice skating, library, skate park, disc golf, BMX park, hiking, watersports and much more.In the summer Lakeland Village is the place to be. The South Lake Tahoe firework show can be watched right from the Lakeland Village beach and dock. In the winter Powderhouse Ski shop opens up in the lodge building for all of your ski rental needs. I have been a proud owner in Lakeland Village since 1998. I currently own two, one as a primary home and the other as a investment. My husband Jon and I take walks on the beach to watch sunrises and enjoy BBQ’s at sunsets. 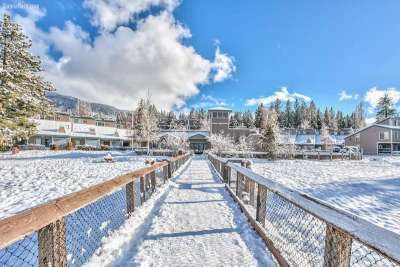 Restaurants such as Riva Grill and The Red Hut both located at the corner of Ski Run Blvd and Lake Tahoe Blvd and also walk-able to via the beach. Just up Ski Run Blvd you will find Cafe Fiore and Nepheles . Across the street from Lakeland Village are local favorites restaurants such as Teps Villa Roma, Big Daddy’s, The Brewery. Shopping, entertainment and parks are all within a few minute stroll as well. Call me for a tour of the property today at 530-545-1231. I have also created a video and photo gallery for your enjoyment.